Say goodbye to the smelly-sponge war that's been brewing in your kitchen! For decades we've been taught to wash our dishes, pots, and pans with an old-fashioned dishcloth or sponge; the same smelly sponge we use to wipe down our cutting boards and counters. Well, guess what - it's time to say goodbye to Smelly Germs and say hello to Fresh & Easy Dish Cleaning - Meet the Scrubr Dishcloth, Bacteria Colonies be Gone! 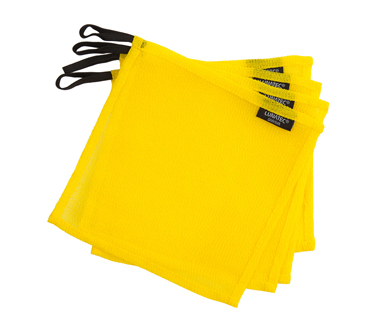 The innovative meshed net material is durable enough to stand up to the biggest of jobs, yet food debris easily rinses away; these dishcloths dry quickly and are less likely to harbor bacteria; they hold up for months and clean exceptionally well! Scrubr is ideal for your RV kitchen, boat galley, camp kitchen, office kitchen, and home kitchen. The perfect scrubber, dishcloth and scouring pad for cleaning your dishes, pots and pans, and kitchen gear while Camping, Backpacking, RVing, and at Home. You'll find yourself wondering why you haven't found these sooner! Quick drying prevents odors and reduces bacteria. Elastic loop makes it convenient to hang and doubles as a compression strap. Excels at cleaning dishes, cookware and kitchen gear. The perfect sponge, scrubbie and dishcloth all in one! Ideal for home, RV, boat galley, and campsite. Fewer bacteria than sponges or cotton dishcloths. Food debris easily rinses free without machine washing. Healthier for you, your family and your kitchen.